We have some great news to share with the family this week. From Monday, July 3rd to Friday, July 7th, eight of our TKS students have been competing in the AAU National Competition in Ft. Lauderdale, FL. The students have been training for a year to compete against over 7,500 competitors from all over the United States of America. 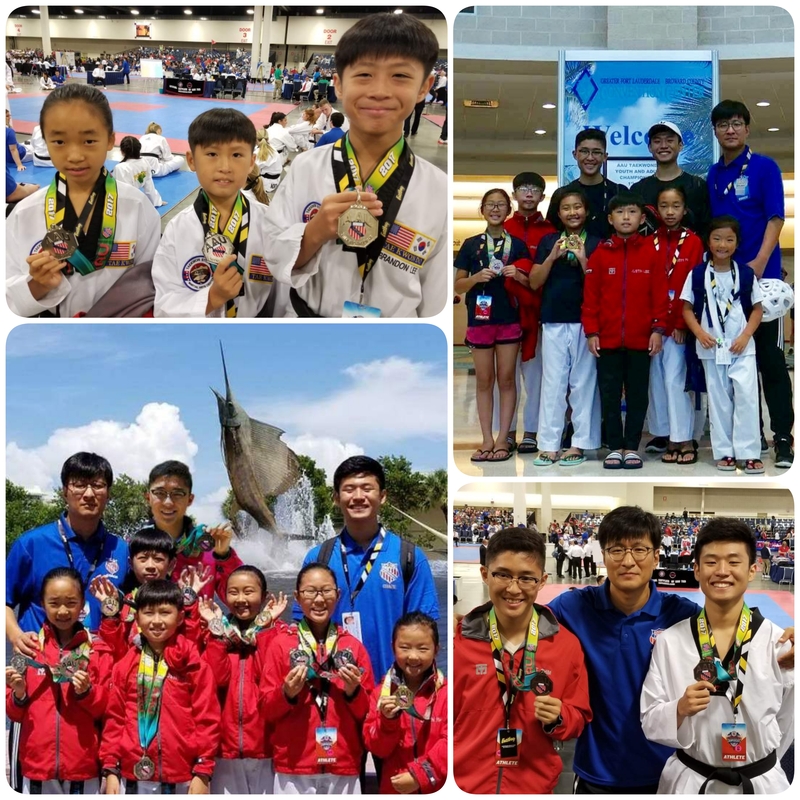 This is a highly competitive national competition where students from different taekwondo dojang’s come to display the technique, athletic skill, discipline, and stamina they have trained for all year. This year was special for TKS Martial Arts because our very first Team Poomsae competed and won the silver medal. Please help us congratulate our team! Our 4th Annual TKS Movie Night is coming soon! We would like to invite our TKS Students (ages 12 and under) & a sibling or friend, who is not enrolled at TKS, to watch Disney’s Moana, play games, and enjoy some pizza and snacks with us. Every year around this time we like to celebrate summer with our TKS students and give our parents some time off. To find out more information and sign up for the event, please see the attached file (TKS Movie Night) and return the completed permission slip with $15 per student by Thursday, July 20th. All proceeds will go towards food, snacks, and drinks for the movie night. Students are allowed to bring a sibling or a friend, who is not enrolled in TKS Martial Arts Center, at no additional charge. Just simply fill out the information about your guest on your child’s permission slip (all guests must be between 5 and 12 years old). Students can dress in pajamas or comfortable clothes to the event and bring their own board games if they’d like. However, we will not allow electronic devices like phones, or tablets to the event. We hope everyone can join us on at TKS Movie Night! We would like to announce the opening enrollment of the 2017 Demonstration Team. A sign-up sheet will be placed in a folder outside of the TKS dojang today for students who are interested. The sign-up deadline is Wednesday, July 21st. The Demo Team will meet from August 1, 2017 to December 31, 2017. There is a $100 training fee for the five-month practice.